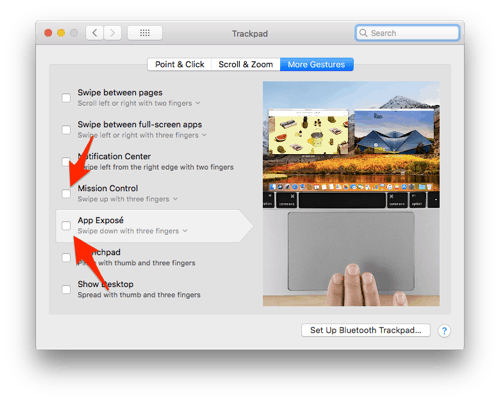 This guide will show you how to raise or lower the volume on your Mac using a Trackpad gesture. Using BetterTouchTool you can configure your Mac to use your keyboard, mouse, trackpad and even your iPhone in all sorts of creative and extremely helpful ways. We’ve covered it before – it’s the basis our tutorials on How to Reverse the Direction of the 3-Finger Swipe on Your Mac and How to Completely Control Your Mac With Your Keyboard. Download BetterTouchTool for your version of OSX/macOS from here. The trial version is fully functional. Note: BetterTouchTool is ‘pay what you want’ software and absolutely worth every penny, but you can decide for yourself before you decide to pay. Once the download has completed, install and then run it. A new item should appear in your main Menu Bar – give it a click. 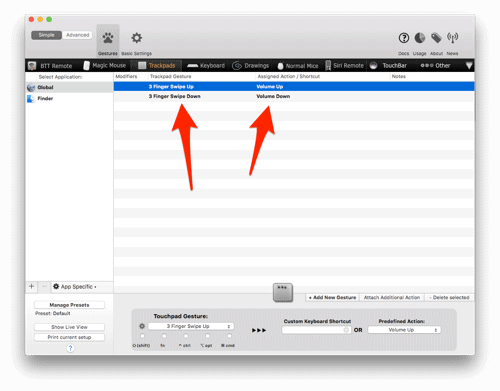 Select Trackpads from the navigation menu towards the top of the main window. Click the Please select a gesture ‘drop-down’ menu in the Touchpad Gesture section. From here you’ll choose the trackpad gesture you want to trigger the ‘increase volume’ action. There are two things to look for here – first up – is the gesture you want to use already being used? Second, do you need to disable a particular gesture from the System Preferences to use it? Since I use the “three-finger swipe-up” gesture to increase volume, I’ll need to disable that gesture first. You can use any of the many pre-defined gestures if you don’t want to use 3 Finger Swipe Up. If you need to disable a gesture that’s already in use, open the System Preferences and navigate to the Trackpad section. From there, select the More Gestures tab. It’s here that you can disable 3-finger up and down gestures (I’m going to use 3-finger swipe-down to decrease/turn-down the volume later). Make sure the Touchpad Gesture: is now set to the one you want to use to increase the volume on your Mac. Locate the Predefined Action: section and click the No Action ‘drop-down’ menu. Scroll down to the Keyboard Keys menu item and select it. From the sub-menu, select Volume Up or Volume Up (Small Step) – you may need to test both to decide which one works best for you. Confirm that both the Touchpad Gesture: and Predefined Action: menus are both properly populated and then give your new gesture a try. If the volume increases ‘too much’ for your liking, try switching the Volume Up option to Volume Up (Small Step). Finally, repeat the above process but this time select a different gesture to trigger the Volume Down key. Ta-da! You can now control the volume on your Mac using a trackpad gesture!